As the month begins at Alumni we want to talk about an important topic for us at SEK Education Group, the internationalisation of our schools, our students and their educational development. We had the opportunity to interview Víctor Arribas, SEK alumnus from the class of 2018 and that, in addition to telling us about his time at SEK schools, also told us about his first year at university, and we saw how he continues to progress, just as he did as a SEK student, on international topics, and he gave us his point of view and experience on many issues. Víctor, from what year to what year were you at SEK schools and what courses did you do? Did you take the International Baccalaureate? I started in year one of Early Childhood at SEK-Santa Isabel in 2003, I studied there until I started in year one of secondary school at SEK-Ciudalcampo. Last year I graduated from the International Baccalaureate Diploma, so I belong to the latest generation of SEK-Ciudalcampo (2018). What memories do you have of your time at SEK-Ciudalcampo? The best memories! It is true that I recently left SEK, but I miss you already. Participation in Model United Nations (such as SEKMUN, of which I was General Secretary in 2017), in debate tournaments, in exchanges (in year 1 of Secondary School I travelled to India with the school in a volunteering trip), in volunteer activities, presiding over the Student Council of SEK Ciudalcampo, participating in the Junior Advisory Board of the Institution … So many experiences that I would not change them for anything in the world! What are you studying this year at the university and where? This year I have started a Joint Degree in European Social and Political Studies, the first two years the programme takes place in Paris, at SciencesPo, and the following two in London, at University College London. Now I am studying my subjects in French and then I will do them in English, at the same time the degree gives me the opportunity to start with German. In what sector would you like to work or what would you like to do when you finish your university studies? At the moment, I am most drawn to international relations and the economics. After the degree I would like to continue with my education, perhaps with a master’s degree in the United Kingdom or at SciencesPo, but I do not rule out starting work during my studies. Both at school, and now, you have focused a lot on international issues, what have you been involved with or are you participating in related to this? Whenever possible, I have committed myself to international politics, debate and citizen participation. I am currently working with organisations of all kinds, creating international events and areas of debate as well as building different platforms to explain the importance of multilateralism, Europe and other political tools that, despite seemingly unattainable, have an impact on our day to day. 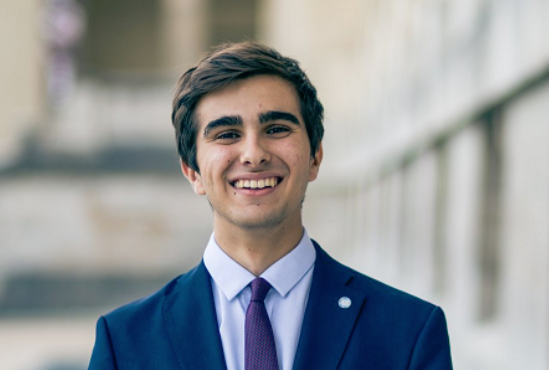 In Paris, I am the Assistant Secretary General in the PIMUN, Paris International Model United Nations, leading a team of 18 people, establishing a topic of debate on international news that will be addressed by more than 200 university students. This year, I am also working with the United Nations Department of Public Information and the International Model United Nations Association, coordinating one of the debates that take place every year in New York with high school students from all over the world, during the NHSMUN event. In Spain, I am still involved with the activities of the European Youth Parliament (which I started at SEK Ciudalcampo) and now I direct the communication of a national education proposal, “Understanding Europe” that seeks to inform young Spaniards about the importance of the European Union. At university, I am also a member of different associations such as the Association pour le Débat en Économie, in which I am in charge of sponsorships with other associations of the university or the association of Nations Unies in which I give training on Model United Nations to my classmates at SciencesPo. Why do you think internationalisation is important in today’s world? What benefits does it bring? Globalisation is a reality, a reality that we have to face, it is not a problem nor an advantage with respect to other times. But it is a situation that makes us wonder: “What will be our response?” We can opt for protectionism, staying out of the game, unable to be part of the wonderful exchange of cultures, languages and communities that we have at our disposal. We can also embrace this new globalisation, without ceasing to be critical of it, learning everything possible from other realities, travelling, speaking other languages and working for greater well-being for all. I, at least, am more of the second opinion. At Alumni we want to thank Víctor Arribas for sharing his story with the entire Alumni Community and we want to congratulate him on his new university stage and for all his activities on international issues, highlighting the worth of the former students of the SEK schools.